I like having turkey leftovers. You can make so many different dishes out of it like turkey pot pies, turkey chili, turkey scramble, turkey tacos, turkey sandwiches and more. I however have this amazing recipe that helps you use up your turkey leftovers, your stuffing, and your cranberry sauce all in one dish. 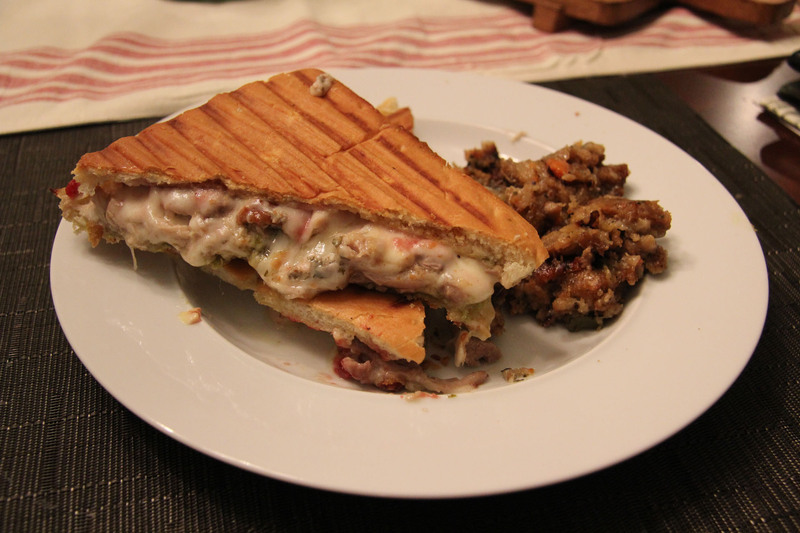 My Turkey Pesto Asiago Panini recipe is super satisfying and delicious and easy to make. I personally choose to use two different cheeses to add some depth to the flavor of the panini. The soft asiago is create for melting in a sandwich and creates that lovely gooey consistency you want to get from a panini and has a little more flavor than the provolone. Try this recipe out and you’ll want to have this sandwich not only the day after Thanksgiving but all the time. * Heat your panini press to high/sear. * Heat a nonstick pan to high and add your stuffing to it. Let it panfry a bit before turning the heat down to low and cover with lid to heat everything through. * While your stuffing is heating and panfrying, you can heat your leftover turkey in the microwave for 1 minute or less. You just want to warm up the turkey a bit (lukewarm is fine). *While your panini is being pressed, you can open the lid of the pan with the stuffing. The stuffing should be hot by now. You can turn the heat back up to high and panfry it both sides a bit to crisp it up a little. *Slice your panini diagonally and serve alongside your panfried stuffing. Buon Apetito!